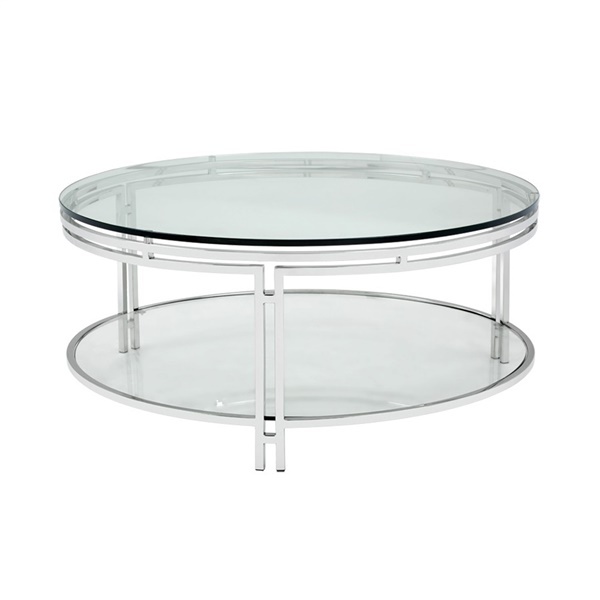 Featuring an icy-cool Art Deco-inspired aesthetic, Sunpan’s Andros Coffee Table catches the eye with its configuration of concentric circles in crisp, clean quality glass accented by the pristine sheen of stable stainless steel. Ideal in all manner of modern motifs, the Andros Coffee Table also offers double the amount of ample surface space for both style and convenient storage. On its own or accompanying other Andros pieces, Sunpan’s Andros Coffee Table brings sleek sophistication to the home or the office environment. Included as part of the Ikon collection. Boasts a thick 10mm tempered glass top and bottom shelf that are sure to impress. Polished steel frame delivers outstanding support. Art deco-inspired design makes the table a great selection in a modern setting.